The rapidly aging global population will challenge the economy and the health care system. How do we improve the quality of life for seniors while mitigating health care costs and reducing the impact on the environment? Our decision-making and business strategies are based on our vision, mission, and values. They help define KARMA’s path to the future. To be the best mobility aid provider. To provide quality and reliable products. To enrich the lives of physically challenged people. Passion – Commitment to our work, customers, partners, and employees. Compassion – Listen, care, and serve. Respect – Treat everyone with respect and dignity. Innovation – Dedicated to continual improvement. Environment – Protect the environment and adopt a sustainable business strategy. The “Four Focuses” strategy has guided Karma in consistently choosing the best course of action to enhance the value of its products and brand. 01. 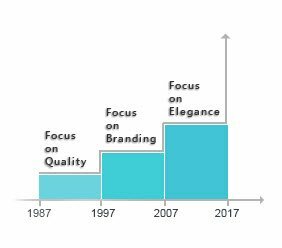 QUALITY – In Karma’s early days, we formulated a “Focus on Quality” strategy to establish and strengthen the quality of our products. 02. BRANDING – Building on the reputation of high- quality, we subsequently developed a “Focus on Branding” strategy to expand and grow internationally. 03. STYLE – Moving forward with the “Focus on Style” strategy, we collaborated with our global partners to develop products with unique styles to suit the varying preferences of our diverse customers. 04. SUSTAINABILITY – The “Focus on Sustainability“ strategy is to protect and restore the environment. The emphasis is to minimize the negative impact on the environment.